Learn how to successfully and effectively speed-read with this self-hypnosis MP3 by Steve G. Jones! Steve G. Jones, Ed.D., Clinical Hypnotherapist, charges $1,500 for a custom recording and $25,000 for a one-hour private hypnotherapy session at his office. But you can get all the benefits for this low price. Simply listen to the Speed Reading Hypnosis MP3 every night as you go to bed for three weeks and feel the changes happening in your life. You will feel more empowered, more in touch with your true self, and you will truly know that your goals are within your reach. Steve G. Jones takes you to the next level so that you can enjoy better focus and concentration while speed reading – NOW!!! Steve G. Jones achieves AMAZING and LASTING results!!! Hypnosis is the easiest way to affect change in your life because the positive messages go straight to your subconscious mind effortlessly so you can accomplish your goals and reach for the stars!! All you have to do is listen to the Speed Reading Hypnosis MP3 session at night as you go to sleep!!! You’ll hear soft music, the gentle sounds of the beach, and the soothing sound of Steve G. Jones’ voice all working together to bring about positive changes in your life easily and naturally. Steve G. Jones has been helping people improve their lives with hypnosis for over 17 years…now it’s time for him to help YOU… don’t wait, do it NOW !!! you’ll be glad you did. See you at the top! Do you ever wish that you were a faster reader? Or maybe you have a child in school that feels that he or she is behind other students in their ability to read. Being able to read quickly and efficiently is important in school and in other aspects of life. It is important to not only have the ability to read quickly, but also understand and retain what has been read. There are different methods of teaching yourself to read at a faster rate while still retaining the information. One method is called chunking. This is when information is “chunked” together in order to increase the short-term memory function. Another technique to keep in mind while reading is not thinking about every single letter in a word. Speeding up the rate at which you read takes some practice. You will learn that you do not have to read every word on a page in order to comprehend what you are reading. Skimming is an important part of speed reading and takes some practice. If you wish to become a faster reader, then I encourage you to practice at it and become a speed reader! And as you continue relaxing deeper and deeper and more deeply relaxed, you realize just how quickly you are able to read anything. You are a speed reader and I would like you now to imagine yourself reading something, anything you choose. Notice how your mind absorbs and comprehends and remembers the words, sentences, and paragraphs quickly and easily and efficiently. Notice the speed in which you read. And as you continue reading notice that it is increasing and at the same time your comprehension of what you are reading is also increasing. You are an amazing reader. You read quickly and you comprehend everything that you read. You are truly a speed reader. And now imagine reading something else, anything you choose. Start by reading a few words. Notice that you comprehend them easily and then you read a few sentences and you comprehend and remember them easily. And now you read a few paragraphs and as you read, your mind stores all of the information and comprehends all of the information easily. And later, when you want to recall the information, perhaps to share with others, you will be able to recall it in its entirety easily and effortlessly. Because while you develop your speed reading skills, you are also developing your comprehension abilities so that the faster you read, the more you comprehend. And now imagine yourself reading another document, this time it seems as if several paragraphs are absorbed by your brain at once. You have a photographic memory now. You are able to glimpse at things and read them quickly and comprehend them and remember them and recite them at a later time, a time at your choosing. So relax now and realize that you are a speed reader. You read quickly and efficiently with total comprehension. 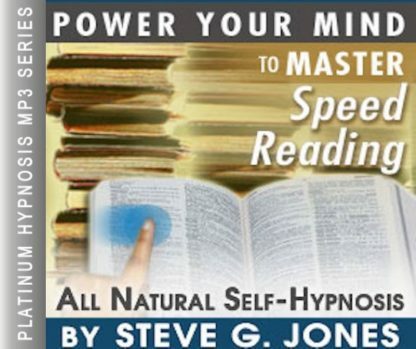 You can train yourself to become a speed reader with help from the Speed Reading Hypnosis MP3 program! We all have the ability to be speed readers, it is just a matter of tapping into that talent. This is why hypnosis becomes such an important tool to use to enhance your reading skills. Hypnosis targets your subconscious mind to help you become a faster reader. As you read, your conscious mind is reading the words, but your subconscious mind is in charge of the rate in which you read and the level of absorption and comprehension of what you are reading. This hypnosis program enhances your speed reading ability so that you can read twice as fast as you used to. We suggest you listen to the Speed Reading Hypnosis MP3 recording for 21 nights in a row. This program will help you visualize increasing the rate in which you read. In 3 short weeks, you will create a new habit of speed reading!